What is a Sunday School teacher's role? The primary task of a Sunday School teacher is to systematically teach the Word of God, specifically for changed lives. To reach that objective the teacher needs to be the kind of teacher who will make a difference, maintain the right goals, teach the way students learn best, and rely on the work of the Holy Spirit. A teacher must thereby "do his/her best to present himself to God as one approved, a workman who does not need to be ashamed and who correctly handles the word of truth" (2 Tim. 2:15). A teacher may equip, disciple, or mentor but what makes a Sunday School teacher's role unique is that the setting yields the potential for systematic teaching of the Word of God. What personal qualities will help Sunday School teachers fulfill this role? 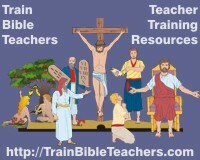 We can list many qualities but the posts on the TrainBibleTeachers.com site from a series looking at 2 Timothy 2:15 will give you plenty for reflection. What qualifications should we look for in Sunday School teachers in terms of spiritual gifts? Ideally, someone with the gift of teaching would fill this position. However, those with the gifts of exhortation or prophecy may also find themselves teaching Sunday School. Teachers with this kind of gifting, unless having a more detailed and analytical personality, will not tend to be as systematic in their approach. Teachers with the gift of exhortation, and not teaching, will be more application-oriented. They will tend to get off on tangents more, going with the flow of the students' train of thought. To best utilize their time, they must work at being systematic and staying more on target. Teachers with the gift of prophecy, and not teaching, will tend to be more preachy and revival-oriented. They will tend to get on soap boxes more, taking a stand against the world's woes. To best utilize their time, they must work at teaching the whole counsel of God and using Scripture for teaching, correcting, and training and not just rebuking. Teaching is a vital work of shepherding but only one aspect. Sunday School teachers who are able and willing to serve their students outside the walls of the classroom will have the most impact on their students' lives. If the teaching gifts are accompanied by the gift of pastor, the Sunday School teacher will tend to feel a compulsion to look after the welfare of the students beyond the class. Teachers without the gift of pastor may need to work at being more deliberate in going the extra mile.